Creating any kind of a deal offering website is not only a lucrative business idea, but also a fairly simple way of learning how to generate extra online income through sponsorships and advertising. Helping to save money for others can help you create some extra income for yourself. The costs of creating a coupon website are generally minimal, and with a dedicated time investment you can quickly become a recognized name in this niche. In this tutorial on how to create a coupon website we will outline the basics of a coupon site, what platform is best for starting such a site, which hosting provider to choose, and how to pick the best coupon website design for your new platform. This post assumes that you don’t have an existing website and/or traffic to monetize, and our goal is that by the end of this post you will know how to create a unique and functional coupons website using the WordPress platform. Keep an eye out for our other posts that discuss digital marketing, but for now, grab a cup of your favorite brew and start digging into the details of this process. If you examine the characteristics of several websites in a particular niche, you will quickly learn about the different features that help to streamline the user experience for that particular niche. And the same philosophy applies to coupon sites. There are features that you cannot live without, and many of such features will make your website browsing experience seamless, pleasant, and highly rewarding. Membership — Allowing users to become members on your site helps those users to maintain a regular interaction with their favorite deals. Furthermore, membership allows your users to submit special deals of their own, helping you to create additional content with no extra cost on your side. Statistics — The word ‘statistics’ in this context is purely for statistics like coupon success rate, user feedback, and social media data. These statistics are otherwise known as ‘trust signals’ and helps users to distinguish good coupon codes between bad ones. Search — WordPress does have a Search function by default, but oftentimes the default search functionality is not enough to cover an entire site of coupons. You need a Search feature that can dig into different categories, store names, and even specific offers. Mobile Design — In this time and age, more users browse their favorite websites from handheld devices rather than desktop computers. As a result, it’s critically important that your coupons website runs on a smooth base of mobile responsive design. This shouldn’t be an issue if you use a reliable pre-made design with mobile-design features already built into the core. Promotional Widgets — These type of widgets are generally used across coupon sites to promote special deals and to advertise partner brands with higher visibility. Apart from making money with direct coupon promotion, your other avenue of revenue making is going to be promotions and sponsorships. Overall, these features act as the base for your site. Any additional customizations you wish to make have to come through your chosen design or through additional plugins. The WordPress Plugin repository is full of interesting and dynamic plugins to choose from, and you can always inspire yourself by analyzing what other websites in the coupon niche are doing. Not only is WordPress an excellent platform to help you save money in the long-term, it’s also used by more than 30% of all world’s websites. The popularity of WordPress stems through its diverse range of design choices — through themes — and website customization options using community-made plugins. Anyone who uses WordPress as their platform of choice can easily replicate the design and functionality of established brands like Groupon and RetailMeNot. Most importantly, WordPress is an open-source solution with one of the most diverse communities across any online content creation systems. 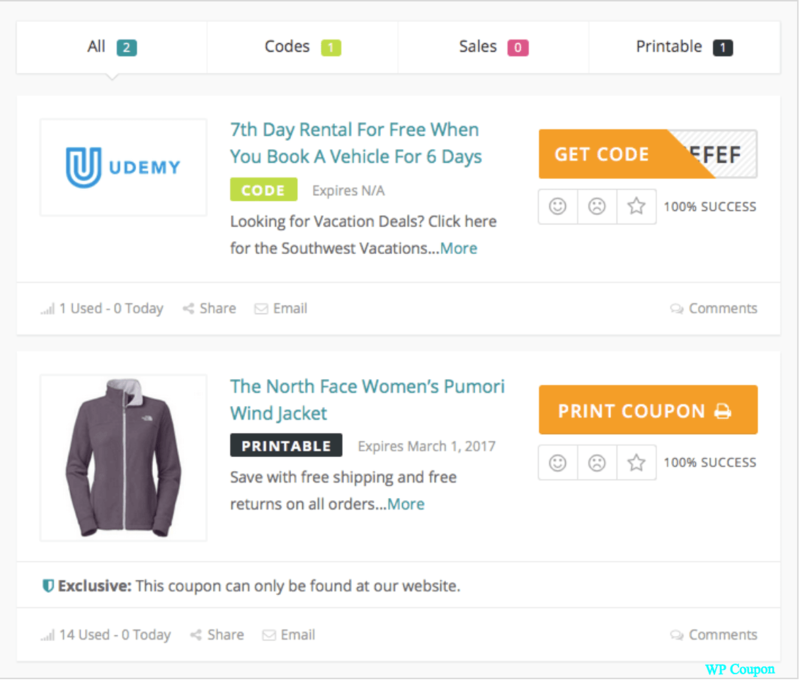 Here is a rundown of the best WordPress features, especially for coupon websites. Freedom — We can’t think of a better platform than WordPress where you will find freedom to customize and adapt the website design to your needs. Developers create not only standalone niche themes but also thorough frameworks which can act as great core foundations for a growing brand. Once you download WordPress, you have complete and utter freedom over the process of adding new features, elements and functionality to your site. Community Resources — There’s nothing better than being able to quickly find a tutorial or a guide on how to resolve a particular problem. In this area, WordPress is without question one of the best platforms for benefiting from community resources. There is the official WordPress documentation, but also hundreds of highly-revered community sites that focus on writing the best guides for making the most out of WordPress. Monetization — Once your site starts to attract a reasonable audience, you will want to plan out the steps to take in order to monetize your website. In essence, you don’t even need to add any additional plugins or themes to enable monetization. However, we do recommend that you study plugins and theme documentations to understand how easy it can be to insert adds/promotions/specials in dynamic locations across your site. Once you have acquainted yourself with the inner workings of WordPress, and understood its basic functionality, you are going to be ready to choose between a hosting provider. A reliable, fast, and secure hosting provider is quintessential to maintain a stable website and ensure maximum availability even while you sleep! The next, and in fact, the last step in your journey of creating a coupon website using WordPress is to pick a design that will match your niche. We at FameThemes develop themes for numerous WordPress niches, and so it happens that one of our themes is actually designed specifically for the purpose of serving coupon websites. This theme is called WP Coupon — a modern directory-based theme for coupon platforms. We have integrated some of the most unique, and some of the most useful features for coupon sites into a single theme. You can see the demo here. Building a great site isn’t just about the way your site looks. It’s also about the functionality that sits at the back-end. For example, it’s important that your site has an exceptional structure of responsive design. There are nearly 4 billion connected mobile devices to date, and this number will grow exponentially over the coming years. With Coupon WP — you can rest assured that the design structure is based on the latest standards in CSS3, HTML5, and Stylesheet Generators such as SASS and Semantic UI. But design structure isn’t the only area that’s refined in this theme. We also implement a number of unique features to make it as easy and flexible as possible for you to start adding coupons and making money! Coupon Listings — Aesthetic design combined with a listing system gives you all the tools you will ever need to deliver coupons seamlessly. Specify details like an expiration date and have old coupons disappear from the main listings to focus solely on working deals alone. Modal Box — Forget about using plugins to promote special deals through modal boxes. WP Coupon gives you a simple method for adding popup boxes that showcase coupon information. Optimized Display Options — Each listing has a success meter, coupon usage statistics, and quick to access sharing links. Visitors can send a coupon code to an email address instantly from the coupon page. Further, WP Coupon adds a comment section so that community members can leave feedback based on their experience. Blogging — If you want to extend your website through blog articles, you’ll be happy to learn that WP Coupon uses a dedicated design for blog posts. Now you can focus on writing interesting content on top of sharing amazing deals! Should you wish to explore more, please refer to our official theme page for further details. As you can tell, we do have a great deal of unique and authentic features to work with. Let’s take a closer look at some of them, starting with the listings feature. 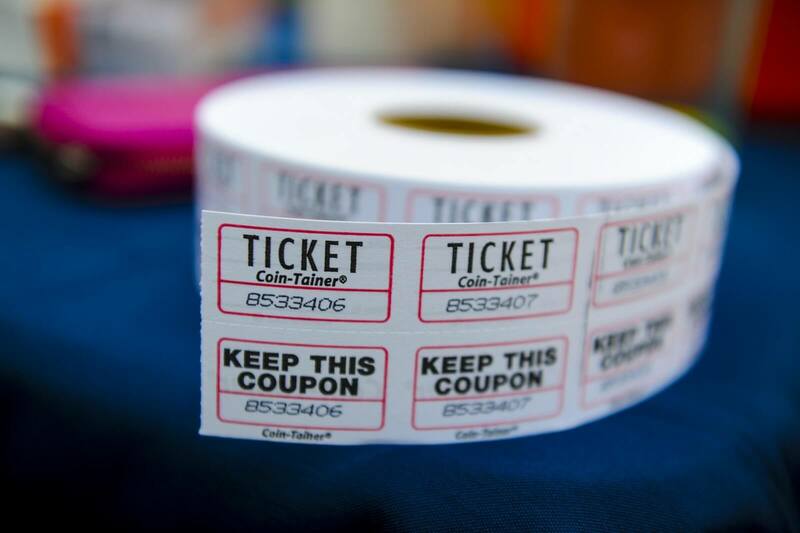 Fundamentally, the coupon listings pages is what defines the feel and style of your website. And with that in mind, we’ve worked extensively to ensure that listings pages feel user-friendly, on-point, and with clear instructions for direction. 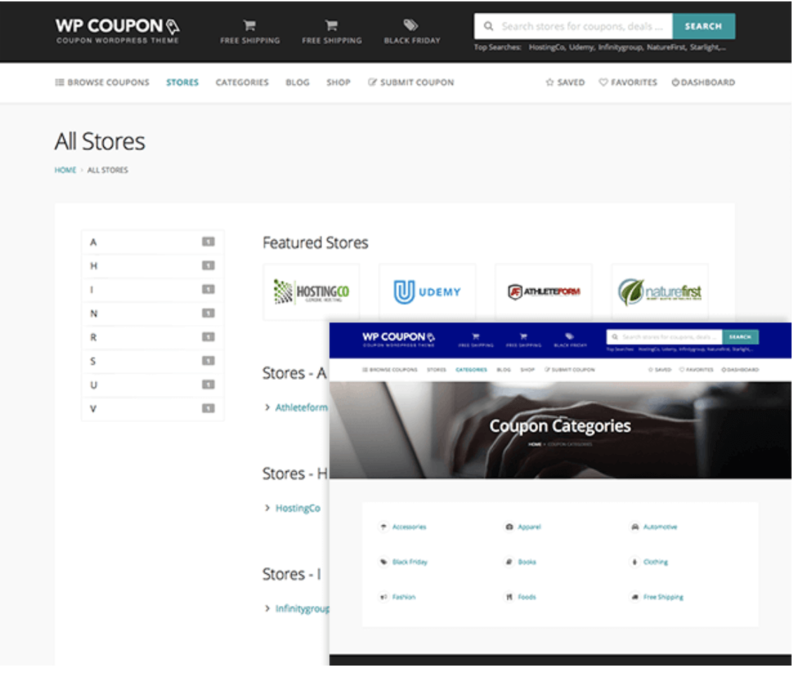 The above screenshot showcases what a normal coupon listing is going to look like using the WP Coupon theme from FameThemes. As you can see, there are filters implemented inside the listings themselves, so that visitors can sort through digitally-based coupons or through specific codes that need to be printed and brough to the store. Additionally, the design is semantic in its nature, without unnecessary bloat or coloring that often hinders user experience. Each listing covers elements like feedback, social media, and ease of interaction. The less amount of time it takes for visitors to find something, the more likely those visitors are going to come back to your site frequently. One of the better design features that can help with visitor retention is specifically content categorization. 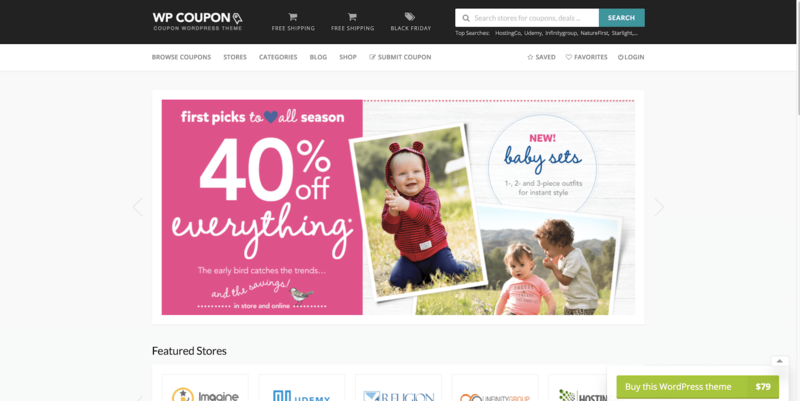 With WP Coupon — all promoted stores and brands are indexed on separate pages. Furthermore, there’s clear and easy to navigate categorization for specific categories, too. This level of flexibility creates a pleasant and enriching user experience. You can, for example, add featured stores and insert images to better highlight good deals. Additionally, users can navigate the Stores listings using simple alphabetical order. Not only is it good for user experience, but also for search engines which often use sitemaps to better understand website content structure. So, now that you know a little bit about WordPress and know which features to look out for when building a new coupon website, it’s time to look at some of the best WordPress hosting solutions. In recent years, many brands have overhauled their business strategy to cater specifically towards WordPress users. And this change means that you are guaranteed to have managed hosting services, with a support team that knows everything there is to know about WordPress maintenance. Our top two choices for managed WordPress hosting are Cloudways and Kinsta. Each is unique in its own way, and both carry a phenomenal track-record of client satisfaction, reliability ratings, and modern infrastructure to provide only the best performance possible. Cloudways is a one-stop solution for managed cloud hosting services. Rather than providing its own server infrastructure, Cloudways relies heavily on providers like DigitalOcean, Linode and AWS (Among other cloud providers) to deliver managed services for the said cloud providers. What this means for you is that you can avoid the tedious and sometimes uncomfortable process of configuring a virtual cloud server on your own. The Cloudways platform lets you pick from your favorite — or most favorable — cloud provider, and does everything else pretty much automatically. To give you an example, you start an account with Cloudways by having chosen the DigitalOcean platform. Your next step is to install your WordPress site, configure mandatory details, and have the site up and running. This is fairly straightforward. But, what if you want to implement analytics or add a powerful caching system to your new site? Doing this manually might take you long hours sitting at the desk, and if you are inexperienced, chances are you might break your site before it’s even launched! In this area, Cloudways tries to cover every aspect of modern and professional digital entity management. To further illustrate this, here are some of our favorite features that you get as a package once becoming a Cloudways customer. 1-Click SSL Activation — Quickly secure your website using the SSL layer provided by Let’s Encrypt. SSL is now a required standard in order to be recognized by Google Search Engine as a reputable source of content. Managed Backups — All your site data is backed up on a daily or an hourly basis, each and every day. On top of that, backups are automatic and stored for however long you require. Advanced Content Delivery — Choose from more than 50+ data centers to deliver your website data from, meaning, you can deliver data much faster to visitors who are closest to the available data center. This feature provides incredible site-speed benefits, which are a significant factor for SEO optimization. 24/7 Support — Whether it’s a bug that is slowing down your site or a site-wide critical error, the Cloudways support team is available to you at any time of the day. If you were to manage a hosting server on your own, any additional support would be a massive expense to you. Lastly, the pricing is based on reasonable standards, and feels right in exchange for the features that you get. Most plans start at roughly $10 per month (with all features included) and you can choose from higher-priced plans depending on how much resources your website is going to use. Kinsta combines the Google Cloud platform together with a team of highly-experienced engineers to deliver a world-class WordPress hosting experience. 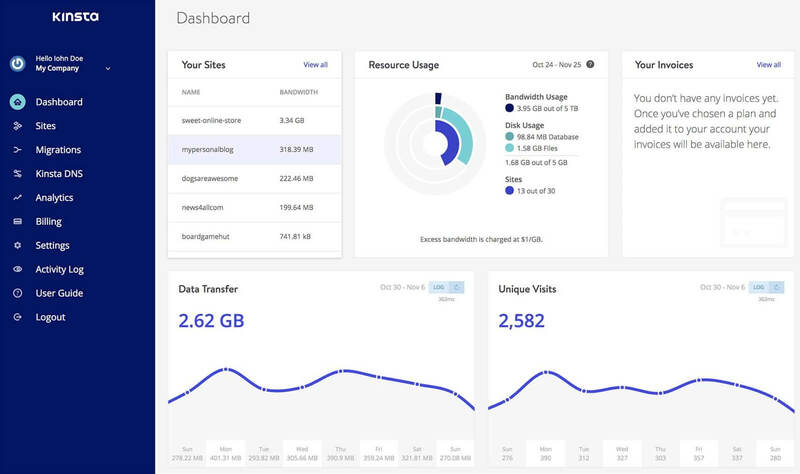 The MyKinsta dashboard is tailored specifically to the needs of WordPress customers, and ensures that anyone becoming a Kinsta customer feels that they are able to have a smooth WordPress management experience. But, it’s understandable that some might express frustration with the idea of using a premium hosting provider, rather than something cheap like HostGator. Kinsta uses a dedicated infrastructure back-end for each website it hosts, which converts into better load-times for pages and content in general. Further, using integrated caching algorithms, Kinsta’s platform can intuitively understand website patterns to deliver content at an incredibly fast rate. Needless to say, this level of optimization is done at the back-end, so you’re not required to install or configure any plugins to yield the immense benefits of a fast and reliable website. Perhaps the biggest upside is, as mentioned, the MyKinsta dashboard. Within this dashboard you gain access to WordPress-specific features to help you manage, create, optimize, and understand your WordPress site better. Server-based page caching optimized for WordPress. Security configurations built for WordPress. Tools to quickly create a new site, or to migrate an existing site elsewhere. Clear website cache from within the dashboard. Do this on mobile, too! Analytical data that displays bandwidth usage, performance ratio, and different stats for file accessibility. Unique database tools to help you mass-manage site content. For example, you can change specific text to have a unique URL added to it. And that’s just the tip of the iceberg! We highly recommend to check out the Why Us page and see what else Kinsta has to offer. We feel that the entry-level pricing of $30 per month is fully justified because of this diverse set of features. Getting started with creating your first coupons website using WordPress is simple and easy. By following our recommendations and outlined steps — you should have a fully functional site operating within an hours time. And should you come across problems, have questions, or simply wish to learn more — you can pop down into our comments section below and share your feedback directly. It’s understandable that someone who is doing this for the first time — making a niche website — would come across some form of complexity. As a result, we’re open to helping out in any way we can. I want to change my coupon website theme http://offerkey.net . How can i buy Coupon WP ?? Thanks for sharing this article. WordPress is indeed the best way to create a coupons site. Because it allows you to add offers one by one. Also, you can import coupons in bulk using CSV format to save your time. Wow this is very useful blog, thanks for sharing with us. There are many coupon API available by which coupon can be automatically gets imported in the website.. No need for manual intervention.